New! 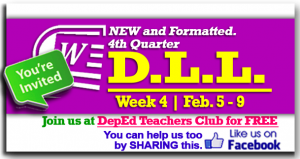 Week 4 – 4th Quarter – Daily Lesson Log (DLL). All of these files are for FREE. Please keep on Sharing and Liking our contributions until all of our fellow teachers all around the country could benefit from this works too. May more blessings come upon us all. Thank you. Objectives: This part of the DLL includes objectives related to content knowledge and competencies. According to Airasian (1994), lesson objectives describe the “kinds of content knowledge and processes teachers hope their students will learn from instruction .” The lesson objectives describe the behavior or performance teachers want learners to exhibit in order to consider them competent. The objectives state what the teacher intends to teach and serve as a guide for instruction and assessment. The content standards refer to the learning area-based facts, concepts, and procedures that students need to learn, while the competencies pertain to the knowledge, skills, and attitudes that students need to demonstrate in a lesson. The competency codes are also logged in this part of the DLL. Content: The topic or subject matter pertains to the particular content that the lesson focuses on. Learning Resources: This part of the DLL asks teachers to log the references and other learning resources that the teacher will use for the lesson. The references include the particular pages of the TG, LM, textbook, and the additional materials from the LRMDS portal. The other learning resources refer to materials such as those that are teacher-made, authentic, and others not included in the references. This part of the DLL can also include the supplies, equipment, tools and other non-print materials needed for activities before, during, and after the lesson. the lesson are being met. These ten parts should be done across the week. Remarks: This is a part of the DLL in which teachers shall indicate special cases including but not limited to continuation of lesson plan to the following day in case of re-teaching or lack of time, transfer of lesson to the following day in cases of class suspension, etc. Reflection: This part of the DLL requires teachers to reflect on and assess their effectiveness. In this part of the DLL, the teacher should make notes on the number of learners who earned 80% in the evaluation, the number of learners who require additional activities for remediation and those who continue to require remediation, the effectiveness of the remedial lesson, the teaching strategies or methods that worked well and why, and the difficulties teachers encountered that their principal or supervisor can help solve.